Ten years ago Comdex - the gigantic Las Vegas hi tech conference and show - was reaching its high point. In that pre broadband internet era of CD ROM's, beige boxes and Windows 95, tens of thousands would converge on Vegas, stay in massively marked up hotel rooms and walk the haloed isles. Ten years ago Comdex - the gigantic Las Vegas hi tech conference and show - was reaching its high point. In that pre broadband internet era of CD ROM's, beige boxes and Windows 95, tens of thousands would converge on Vegas, stay in massively marked up hotel rooms and walk the haloed isles. Even as these eager conventioneers were stuffing bags with hundreds of color brochures, business cards and hokey promotional trinkets as they watched the booth jugglers and babes, web 1.0 brochure style web sites were being crafted around the world for the 'cyberspace surfing' (remember that?) generation that was rapidly gaining critical mass. The web ultimately superceded the mega show because information gathering became more efficient and fluid online. It took time to read all those brochures and then try to stay up to date... The same fate befell the giant E3 computer games show for essentially similar reasons. Today there are no peak industry moments, now we have a continuous torrent of information. 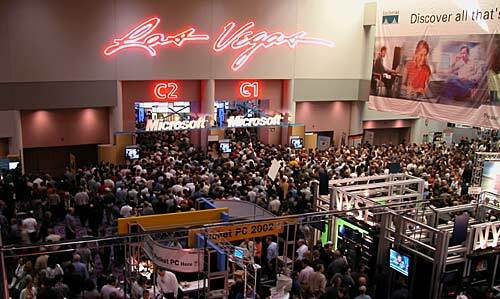 Pre Y2K, Comdex and E3 were the place to be, both to gather information and to meet and deal. Interestingly smaller industry conferences are very successful, but a lot of the important wheeling and dealing goes on in hotel suites near the show floor by people who are never at the show. There is no question that human nature being what it is, nothing replaces real world interaction between people, particularly to seal business deals. What's intriguing to me is that increasingly the online conference community back channel, Twitter and blogs are as important as the live presentations at conferences. Frequently the discussion is more lively online than onstage even as a session is running, and sometimes online and live merge with questions posed electronically being discussed on stage. Just as Comdex was superceded by the web I suspect we are on the cusp of online conferences - complete with community spaces and video communication - really taking off. Ironically it's difficult to cater to the wifi demands of a conference hall full of uber nerds, but if they are all communicating and collaborating from their known good 'home' connections the quality of connection should be excellent. Most conferences these days have video of the keynotes streaming live and then subsequently posted online, and by reading blog posts, Twitter hashtags and pres summaries it is possible to pull together a good representation of the conversations. Tweetups plus Britekite, Dopplr and other online locators increasingly allow us to connect with cohorts and thoughtleaders for face to face meetings when we are in the same geographical location. As airfares rise, digital video quality and utility is also increasing. Collaboration is increasingly continuous - rather than piecing together a conference you couldn't attend from online fragments, wouldn't it be great to participate in real time online? To be able to attend the sessions that you're looking forward to, contribute as well as learn, and get a lot of other things done in your life, plus get other work done that day as well? The added value is in kicking off conversations in community spaces and wikis that could continue long after the 'conference' component is over. The reality is likely to be a hybrid of venue based and online, but I wonder what a 'conference' will be in another ten years?